This Nativity set is carved from Tagua nuts in Ecuador. The set includes 14 traditional figures: Joseph, Mary, baby Jesus, two angels, two shepherds with lambs, an ox, a donkey, two sheep that remind me of polar bears, and three wise men. The Joseph figure measures 2.75 inches tall. 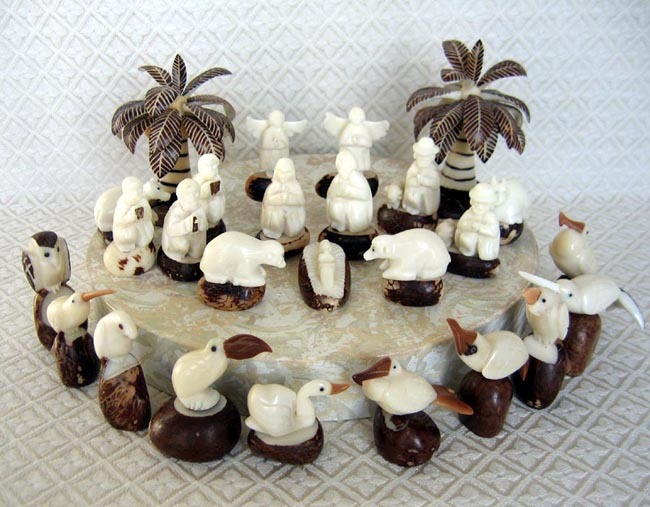 In addition to the traditional Nativity figures, this set also features 10 birds carved from Tagua nuts (from left to right): brown owl, smaller colibri (hummingbird), parrot, toucan, white swan, frigate bird, Galapagos bird, Amazon parrot, larger colibri, and pelican. Two palm trees, also carved from Tagua nuts, complete the scene. The Tagua nut goes through an interesting metamorphosis. When the nut is green, the center is a watery, gel-like substance that soon takes on a milky color and is sweet to the taste. Many native people drink this milky sweet liquid. However, if the Tagua nut is allowed to dry, the liquid center becomes very hard and takes on a beautiful ivory color. For this reason Tagua is also known as Vegetable Ivory. The composition of the Tagua nut is so similar to mammal tusk that it is difficult to tell them apart. The Tagua nut is an important product both economically and ecologically. Economically, it provides an accessible and plentiful art medium for talented artisans, allowing them to earn a living where economic options are very few. Ecologically, the economic activity of Tagua carving preserves rainforests because Tagua palm trees are more valuable than the land underneath them. This fact deters the clearing of rainforests for farmland.